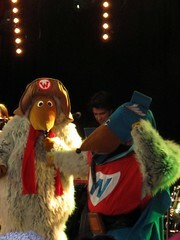 The Wombles appeared at Glastonbury Festival on the Avalon Stage from 2-3pm on Sunday, 26 June. Sadly their performance wasn’t broadcast by the BBC, despite public demand, as it doesn’t record every stage. 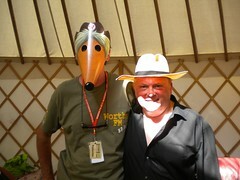 But Mike Batt has confirmed that the show was filmed for Dramatico (The Wombles’ record label) and they’ll be posting footage soon. Tidy Bag ‘liveblogged’ The Wombles’ appearance thanks to the wonders of Twitter, retweeting all the best comments and adding photos from audience members (below). A big thank you to everyone who tweeted news and photos during the set. If you were lucky enough to be there, please share your pictures or tell us what happened! Follow @TidyBag or stay tuned for the latest updates, photos, videos and press coverage. 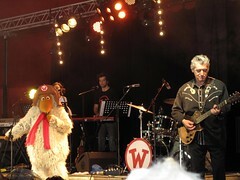 The band (Orinoco, Wellington, Bungo, Madame Cholet and Uncle Bulgaria, plus Alderney, backed by a few Human Beings) took to the stage around five minutes late, opening with the popular Remember You’re A Womble. 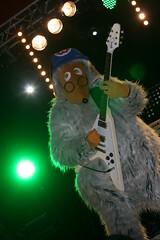 Twitter users also revealed that the setlist included Womble Of The Universe, Superwomble and the rather unseasonal classic Wombling Merry Christmas. 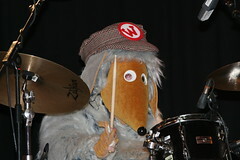 There were rumours that famous musicians might be inside the costumes – from Florence Welch to Dave Grohl – but the identity of the live band was a well-kept secret (although a few people had let slip on Twitter that friends or relatives would be appearing with The Wombles). However, the NME reports that original guitarist Chris Spedding did make an appearance for the end of the set, ‘in civvies’, as Mike Batt hinted last month. PromiPranger: Was zur…?! Diese Viecher durften beim Glastonbury Festival auftreten? / @TidyBag BBC didn’t grace us with their interest, but we filmed it with 5 HD cams, so will be posting footage soon. / @TidyBag Thanks 4 yr support and “news collating”. Woms gig was a huge buzz. We drew more people than the Pyramid stage at that time. 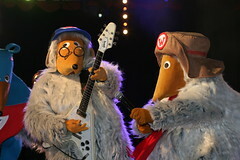 excellent coverage of #Wombles live at #Glastonbury by @TidyBag put the #BBC to shame!